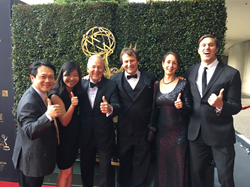 With two special episodes debuted last fall, a joint production of the “Iron Pathways to Adventure” by the Tourism Bureau of the Republic of China and Joseph Rosendo’s “Travelscope”, the well-known travel series on Public Broadcasting Service (PBS), received nominations for the Daytime Creative Arts Emmy Awards for Outstanding Cinematography and Outstanding Sound Editing. This is yet another recognition of Taiwan's beauty at an international competition since the winning of the 2014 Emmy Awards for the “Taiwan Lantern Festival”. In the “Iron Pathways to Adventure,”Daytime Emmy Awards winner Joseph Rosendo discovers cultural treasures along the ride of the Taiwan railway. With his humorous and knowledgeable hosting style, he guides his audiences through Taiwan’s railway system to embark on a joyful journey and explore the natural and cultural landscapes along the tracks. In a friendly yet thorough fashion, Rosendo introduces Taiwan’s round-the- island railway system, types of railways, Taiwan’s High Speed Rail, the extension of Alishan Forest Railway with its surrounding attractions, delicious cuisines and cultural events, Ten Drum Culture Village, Kaohsiung MRT, Ciaotou Sugar Refinery, gourmet ice-cream in Shaochuantou, Cijin seafood, Hakka Lei Cha and more, showing viewers the importance of the Taiwan Railway development to Taiwan’s economic growth.